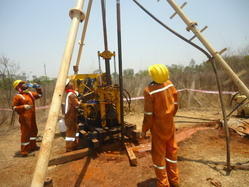 We are a leading Manufacturer of soil investigation from Mumbai, India. Below-ground investigation by boring, sampling, and testing the soil strata to establish its compressibility, strength, and other characteristics likely to influence a construction project, and prepare a subsurface profile and soil report. Also called foundation investigation, soil investigation, soil test, or subsurface investigation. See also soil mechanics. We have extensive experience of managing land contamination on sites identified for development and also on operational facilities, where impact may be large for site owners and developers alike. Having identified any impacts by appropriate, well-designed investigation we assess and address such issues by providing considered remedial options, thus mitigating financial risk.